Local underwater archeologist and alumnus leads charge to preserve Silver Spray and surrounding site. Her name is the Silver Spray, and she’s our largely forgotten neighborhood shipwreck. In the last moments of her final journey on July 15, 1914, the 109-foot wooden steamer was within sight of the Hyde Park shoreline. Two hundred University of Chicago students were waiting to be ferried across the lake to Gary, Indiana for a tour of the steel mills. She never made it. As she pulled even with 49th Street, the ship shuddered and came to a halt. She had run aground on Morgan Shoal, a million-square-foot shelf of submerged rock that juts a half-mile into Lake Michigan. It’s a known navigational hazard, but it still takes vessels by surprise. The area is sprinkled with sheared-off propellers, and it’s not uncommon for ships to require towing off the rocks. The Silver Spray, however, would not be so lucky. For three days the U.S. Life-Saving Service tried, and failed, to remove its 95-ton bulk from the shoal. By July 18, the weather had changed for the worse, kicking up waves and calling off the rescue effort. Exactly what happened next is the subject of “ongoing research,” according to Greg Lane, a Hyde Park resident, College alumnus, and amateur underwater archeologist who has become passionate about the wreck since swimming out to it for the first time several years ago. What is clear is that, through some combination of wave action and possibly fire, the ship was destroyed on the night of July 18. The crew was on board at the time, as were several passengers (Lane surmises they may have been curious UChicago students checking out the stranded vessel), but no injuries or fatalities were recorded. Local newspapers also reported that crowds gathered on the beach to build bonfires out of the smashed pieces of the deck. Surprisingly, however, the remains of the ship were never removed, and have survived nearly a century in the lake. A few feet of the boiler sit rusting above the water line; from shore, you might easily mistake it for a rock. However, this is just the tip of the iceberg. Beneath the surface lie large sections of riveted metal, now covered in a thick coat of algae. There are also propellers, which look to be about the size of a small child, resting on the bottom, as well as smaller pieces of debris from the Spray and other ships that have run into the shoal. Morgan Shoal is not just special because of the wreck. As the shoal closest to the Chicago shoreline, it presents an unusually accessible example of the rich ecosystem supported by such rock outcroppings, which stand in marked contrast to the otherwise sandy-bottomed lake. In addition to wavy green sea grass, it hosts a wide variety of aquatic life. In spring and summer, large bass go there to spawn. Migrating birds, too, are frequent visitors. Wave action has also carried bits of the 300-million-year-old limestone to shore, forming the rocky stretch known to locals as Pebble Beach. If you look hard enough, it’s possible to find fossils of tiny crustaceans among the rubble. But that paradise may be under threat. Though the area is one of the few parts of the lakefront that has remained relatively unaltered, the city has been talking about building over the shoal for decades. As part of shoreline improvement efforts in anticipation of the 2016 Olympics, plans were drawn up to create new beaches, wetlands, and a peninsula, which would have covered a substantial portion of the shoal with landfill. Chicago’s losing Olympic bid and the financial crisis have derailed the alteration of the shoal for now, but Lane worries that without legal protection it may be only a matter of time before this unique environment is destroyed. As such, he’s leading a survey of the Silver Spray wreck by the Underwater Archeological Society of Chicago, which has also won an endorsement from the Surfrider Foundation. He hopes that it can help lead to the creation of a preserve covering Pebble Beach, the shoal, and the ship. 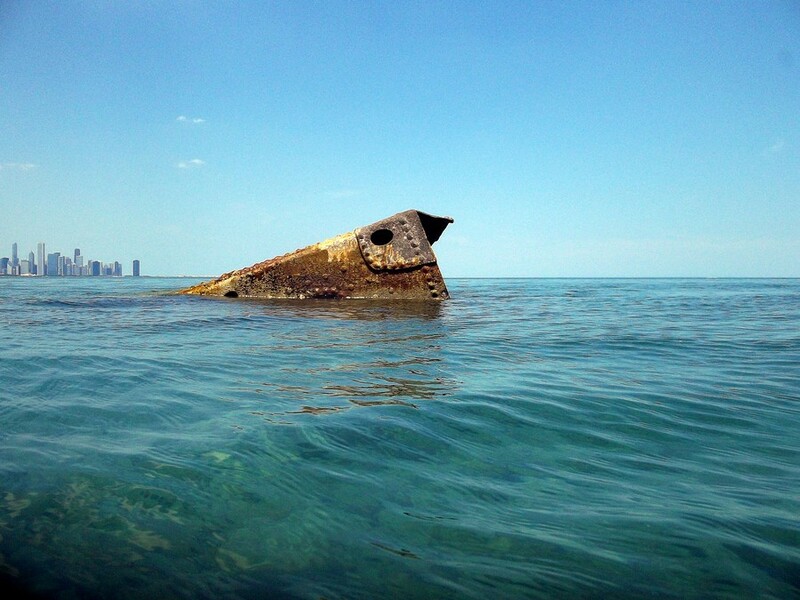 Some form of official designation has been awarded to many shipwreck sites and underwater areas of natural interest elsewhere in the Great Lakes, but so far, never in Illinois. “If the city of Chicago is at all sincere in their rhetoric of sustainability, protecting the concentration of resources on Morgan Shoal and Pebble Beach is foundational, bedrock, radical sustainability,” said Lane, arguing that the best thing to do with the area is to leave it as is. “It’s not within our rights to destroy it. There’s too much that’s too good for future generations to mess this one up.” The survey will not be completed until the end of the year at the earliest. Even then, convincing the city to take such an unprecedented step will likely be a difficult effort. Lane admits he cannot do it alone, and hopes more people and institutions will express interest in the preservation efforts. Despite the challenges ahead, however, he’s already picked out an ideal inauguration date for Chicago’s first coastal preserve: July 15, 2014, a century to the day since the Silver Spray ran aground.